How do we even go about promoting our work? First up, there's these 73 tips for promoting your blog post. Let's get more specific about Pinterest though, shall we? We already pin to our own board and then pin out to group boards, but what else can we do? The goal is to have people see our beautiful pins and repin them organically, of course, but giving them a hefty nudge to start can go a long, long way to providing social proof and getting the attention of the Pinterest Smart Feed. One great way to get more repins is to participate in pin promotion groups. 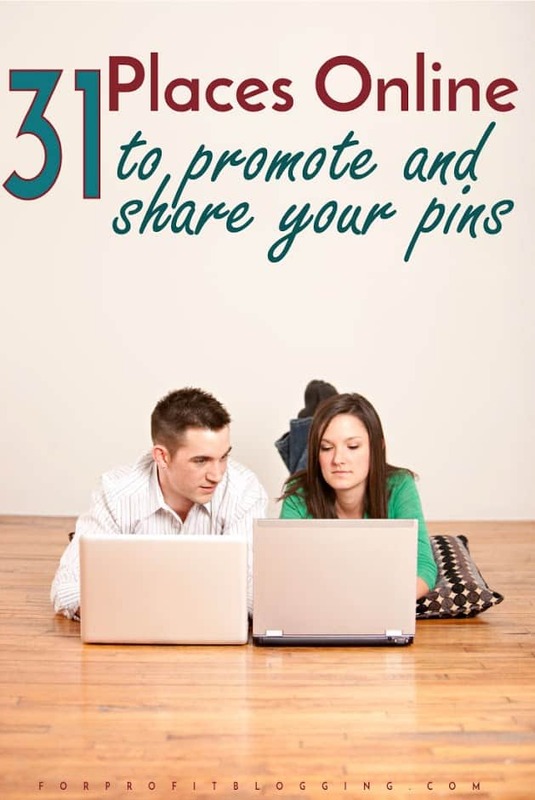 Pin promotion is a central part of a good blogger Pinterest strategy. Every group has different rules, with my strong preference being groups that only require you to repin a selection of pins, not every single one in the thread. This way, you can select things that are appropriate for your audience and meet your quality requirements. We've pulled together a list of 31 (and counting) places where you can promote and share your pins, regularly. This list is (almost) exclusively for Pinterest and does not include groups where Pinterest follow or share threads are only on specific days of the week. Almost all of them are Facebook groups, though a few are on different platforms. Groups are listed by any-niche pin sharing, specific niche pin sharing, non-Facebook groups and Pinterest Facebook groups on more general topics than just sharing. Make sure to follow all of the rules and experiment with different groups until you find one that is a good fit for your niche and your brand. This group is a spinoff of the Inspired Blogger's Network group. Daily pin threads require pinning two others for every one of yours. You are allowed to submit multiple pins per day, as long as you repin two others for each one of yours. All niches are welcome. There are a lot of homeschool, food, gardening, blogging and Christian living pins in the lists every day. This Facebook group, organized by Catherine of Thinking Outside the Sandbox, is a fun concept. Bloggers apply and are put into groups. Each day you pin 10 pins for one name on the list, totalling 70 pins for that person in a week. The following week you work on the next person in the list. Groups are matched up as best as possible for similar topics and similar size audiences. It is an excellent way to ensure you are getting lots of repins on your content, in front of relevant audiences. This group has repin threads sorted into various niches, including Recipes & Food, Health & Fitness, Blogging & Social Media, Money & Finances, Love & Marriage, Parenting & Motherhood, Crafts & DIY, Lifestyle & Home, Faith & Religion, Beauty & Fashion, and Holidays & Seasons. You can pin up to one pin per day in each thread and in exchange you repin five other pins from that thread. There are also follow and group board threads. This group isn't too active, but we could change that! It's a public group, so easy to join. Maximum 3 posts per day. Daily promo thread, with the group wall reserved exclusively for use by the admins, so only pinterest threads, nothing else distracting from its purpose. Daily pin threads with repinning requirements for Sat/Sun (after everyone has left their links). I ♥ Pinterest – Share Your Pins! This group has files to list your profile for follows and people to follow, you are allowed to post your pins to the wall and there are no requirements for repinning. Pinterest Party is a group for Pinners who love to collaborate and share! We'll be focusing on growing your Pinterest following, as well as tips and tricks for making Pinterest an awesome marketing avenue for your HubPages, Wizzley, Etsy, Zazzle and blog posts. This group has a quarterly Pinterest swap. This group covers most social media platforms, not just Pinterest (Facebook, Twitter, Instagram, YouTube, Pinterest, Google +, Tumblr). No religious or political content; famly-friendly and drama-free! A group for bloggers to promote their pins daily. If you drop a link in a thread, you are responsible for repinning all that day. One for one social sharing of posts. Post shares can be done on any platform, including Pinterest. No MLM/Forex/Diet/similar posts. This is also open to Etsy items, Cafe Press items and Zazzle items. Strategy, sharing and support! This group has pin share threads for all blog niches. In order to be admitted into this group, please sign up right here (it's free! ): http://bit.ly/signup-avt. One pin per day that is vertical, family friendly and in English. Of course they also need to relate to travel! This group is for travel blogs, rotating through geographic and travel type categories, like Solo Travel. Daily sharing threads, weekly tip threads and Q&A threads. This group is open to DIY & Home Decor bloggers and includes both information and pin for pin threads, every day of the week. This group is to support DIY bloggers on Pinterest, in particular on group boards. This group is for teacher related pins and has pin for pin threads each day. It is probably a good place for homeschool bloggers to participate, depending on the content of your posts. Share up to two pins and repin two pins. Family-friendly content only, no religious posts, no ads, no product reviews, no giveaways. Members must have at least 1,000 Pinterest followers. This group is for people who sell on eBay, Amazon, Etsy, Bonanza, etc. It is not geared towards MLM sellers or Brick and Mortar stores. Each week there is a theme to pin from each other's boards. This site uses a linky party to host a pin share thread. Pin the five featured pins and then submit your pins to the group. You may be selected as a featured pin for the following week. There is Game A and Game B and you are allowed to submit to both. It's also a good source of other content to pin. The site graphics are dated, but the concept and repinning is great. This works the same way as the Pinterest Game. The hosts pin all submitted pins and participants need to pin the Featured Pins. This group has directories of group boards, sorted by niche, including details on how to join. You can also link up your group boards. Make sure to follow all of the instructions! This group is a place to list your group boards and to find boards to join. This is a smaller group designed to help each other increase social media followers. This group is based on one person who will follow back, as long as you follow him. Where Else Do You Share Your Pins? Let us know which groups should be added (or deleted) from the list. What are your current pin promotion strategies? This is a great resource. Just what I’ve been looking for. Pinning now so I can come back to at any time! Great Facebook Pinterest group board threads. Great resource.